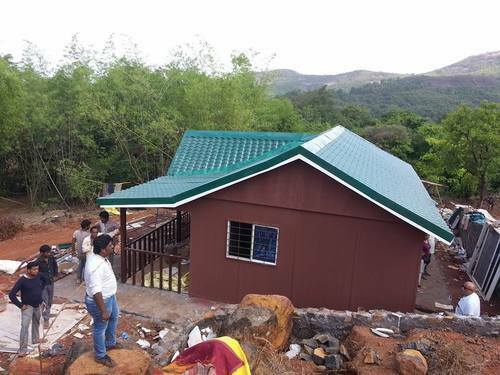 Janhavi Prefab Green Homes was established in the year 2011. India's & Dubai's Leading Manufacturer of Portable Prefab Farmhouses, Site offices for Builders and Land Developers, Security cabins, Toilet cabins, ATM Cabins, School Cabins, Restaurants, Resort Cabins, Car Parking Sheds and PPGI Colour Profile Sheets.The gamut are manufactured using high grade of raw material and latest technology. These are widely acknowledged all over the country for its decent look, high durability, strength and reliability. We are dedicated towards developing long-term and mutually-enriching relationships with our customers by offering them exactly what they demand for. We always seek to ensure that our clients receive quality products of proven effectiveness and known characteristics at a competitive price. We are committed in manufacturing quality products. We have support of sophisticated manufacturing unit, which is spread across a wide area. The unit is installed with modern tools, machines and technology. We have appointed a well qualified team of quality analysts who supervise all business operations as per national quality standards. Our people are dedicated to creating long term profitable relationships by continually multiplying value through reducing variation and eliminating waste in everything we do.